Kanjoose, is a chrome browser plugin which is an easy and faster price comparison plugin for saving money and time while shopping online, it supports major online shopping sites like Ebay, Amazon, Flipkart, Myntra and many other online shopping sites, here is the full list, it supports! This is an exclusive review of Kanjoose chrome plugin, like first time on net, and only available in ALLTOP9, developer of kanjoose plugin, contacted us, and we tested it, and it’s working like charm. let’s get back to the basics, what actually happening now around? 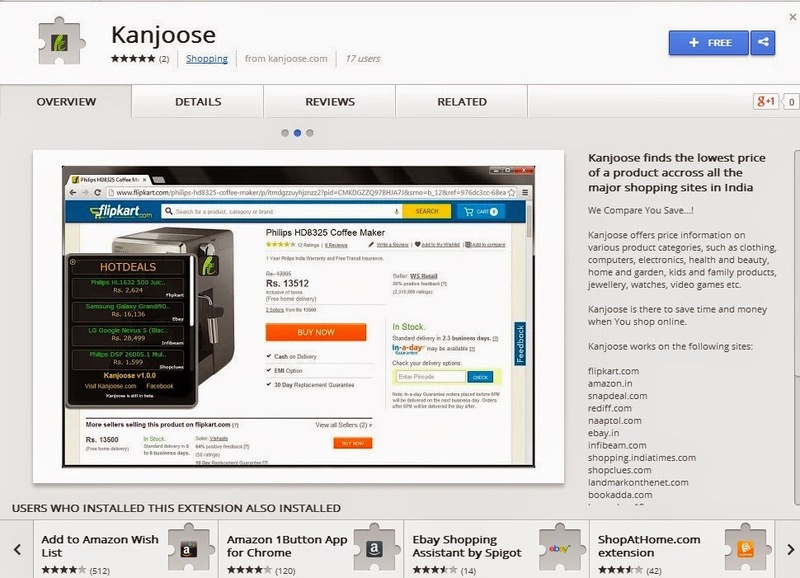 But now we have Kanjoose, it’s just a chrome plugin which will save your money by showing least prices as possible from the above mentioned sites and decreases the product search time and you can stop searching products on multiple Ecommerce sites to know the prices of that product! Step 3: Let’s see what happens after using Kanjoose plugin, Every time when you search for a product in any ecommerce site mentioned above, you can see ‘K’ symbol like this! Step4: Just click on the ‘K’ symbol and you can see a popup prices like the screenshot below! 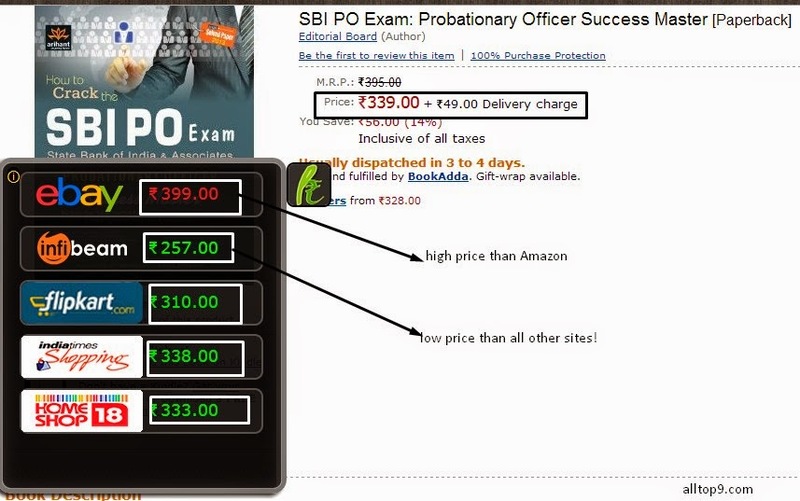 You can clearly see amazon price is 339 rs and ebay price is comparatively higher than amazon as it is 399rs (so it is in red) remaining all the sites have less price compared to the amazon, and out of all Infibeam provides the lowest price, so just click on that Infibeam and you will redirected to the product page, see it is that simple! In Short: Just go to any ecommerce site, and search for your favorite product, click on K besides the image, you can see list of prices, compare with all other prices, choose which is cheap and best! Click on the link and buy it! very simple right? Kanjoose compare and provides prices of the selected product on the multiple Ecommerce sites (Flipkart, Indiatimes, Homeshop18, Infibeam, Naaptol ,snapdeal etc as mentioned above) . Now , Kanjoose Plugin supports more than 21 Ecommerce sites and it is still in development and in next releases it will be supporting more Ecommerce sites . The working functionality of this chrome plugin is it will work in the background and gets activated only when you visit inside product detail page (it doesn’t track any personal data). If the plugin finds a lower price on the product detail page, it alerts you with a little note inserted right into the left page you are browsing. This plugin works as-promised and what’s commendable about the plugin is that it doesn’t really expects users to ‘initiate’ anything and works in the background. Kanjoose is developed, so as to be the most relevant price comparison plugin. It alerts user about the lowest price in the green colour and highest price in red colour number along with the Ecommerce sites logo before the price in which they are available . When you will click on the logo it will divert you to the website which you choose . so mainly it saves money and time of the user by searching product on multiple Ecommerce sites which are having product availability as Kanjoose means miser person in English, it apts for this plugin and it works pretty much great as promised! As it is still in initial stage (beta) you might face some errors, please report it to us, and we will try to contact the developer and we will try to resolve the issue/bug asap!